Nicolas started his aviation career at the age of 17 at the University of Illinois and currently works as an airline pilot based out of San Juan. He describes himself as reliable, competitive and goofy. He describes his Teammate as rough around the edges and not too excepting of people who go against his advice. This grandson/grandfather duo believes that Nicolas’s traveling expertise will give them a leg up against the other Teams. Donald has been married for 42 years and has two children. The sparks will undoubtedly fly along the course of the Race as Donald is never shy about telling his grandson what to do. While Nicolas relies on his ability to read maps and quickly navigate computers, Donald relies on old school street smarts and claims to be a jack of all trades. Regardless of who's calling the shots in the heat of the Race, these two are looking forward to traveling the world together and creating lasting memories. 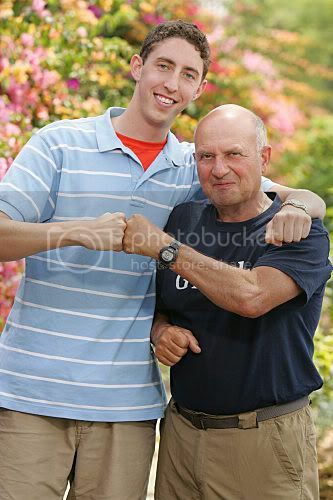 I love this Grandpa/Grandson dynamic. I don't know why TAR hasn't done something like this before. Aww, I love this team already! They're so cute & look like they have a great relationship. Gooo Nick n' Donald! This is a team everyone can root for. I really hope they make it to the Final Three. Donald, how'd you manage to drive into the curb!! For pete's sake, watch where you're going! Or better yet, let Nick drive. But you made it to the pitstop in time, so Kudos to you both! Some Grandpa LOVE !! You rock Donald!! Yeah! Some more Grandpa Love He's doing better than I expected, & he and Nick are working together real well. Grandpa was so cool milking the camels....just did it w/ no fuss. Did we know that Nicholas is Robbie Fulks' (the musician) son?? Nic is back at work; also, some (polite) trash talk about Aer Lingus. Nick, 68, stripped down to his underwear to pole vault, while grandson Donald, 24, watched — which set a pattern for the popular pair. 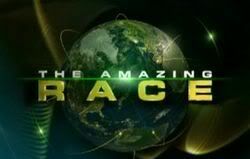 December 24, 2007 -- LOVE 'em or hate 'em, Nicolas and Donald, the first grandson/grandfather team to appear on "Amazing Race," have become the most talked-about competitors on the most popular edition of the show yet. The pair - airline pilot Nicolas Fulks, 24 and retired jack-of-all-trades Donald Jerousek, 68 - have, for six legs of the race so far, managed to remain with the pack in their dash around the world on the popular CBS reality show. Again last night, they managed to hang on, despite fierce odds. The unlikely popularity Nick and Donald seems to come from the fast, familiar banter they have on the screen. And not least because Nick is the randy, right-back-at-you grandpa some people wish they had. "This is a team that is completely relatable," the show's creator, Bertrum Van Munster, told The Post. "Nicolas appeals to the younger crowd and Donald appeals to an older crowd. "I think they are almost a pure example of what the whole show is about - something that anybody can relate to," he says. People really took notice of Donald after Week 3 when, after dancing with a rival team of young, blonde sisters, he remarked: "They're hot. There's no doubt about it. They're feisty. They're a little bitchy, but not bad. If I was a little younger . . ."
The "hot" comment cemented Nick as someone to keep an eye on - especially if you were young and attractive and he was right behind you. "Worry about yourself," Donald barked at his grandson at another point - when Nick complained his grandfather was not paddling fast enough. "I'm helping here, whether you know it or not." Nick and Donald work well together, but what has fans flabbergasted is Nick always stepping aside to allow his headstrong grandfather to tackle the highly physical challenges the show's producers dream up. "The man is nearly 70 years old, but he's strong as a bear," says an amazed Van Munster. The ease the pair have with each other on camera may also have a bit to do with their family's celebrity status: Nick's father is country music star Robbie Fulks who is married to Donald's daughter, singer Donna Jay Fulks. "I was turned on to Robbie Fulks [music] when he accidentally impregnated my mother," Nicolas deadpanned in a profile posted on his father's Web site. "They snark, they laugh, they don't seem to feel the need to attract attention and camera time through outlandish behavior (be it arguing, yelling, or constantly proclaiming their outsider status)," writes a fan called Whammo on the popular, Television Without Pity Web site. "They respect each other, and they seem to enjoy each other a helluva lot more than any other team left on the race." Wait, isn't it Don who stripped and Nick who watched? Hopefully they will win the race! Me too, jonnal! Love Gramps! He rocks and just keeps going like the energizer bunny! He and Grandson get along good & have done a fantastic job going far in the Race. Cheers to them and hope they win! Oh yes! Gramps and grandson made it! And Nic is pretty supportive too, hes carrying the load and stepping up! It would truly be amazing should they win The Amazing Race next week! I didnt catch the preview properly so hopefully nothing goes wrong! Rock on Don & Nick! WTG! !